The visit of Canadian and American importers in Poland has come to an end. Over the course of five intense days, they had the opportunity to learn about the European system of meat and cold cuts production in practice, to meet with European producers, and to see the wealth of products offered in European distribution. The subject of their meeting with the European Commission representation in Poland was the meat production system in force in the European Union. The participants of the study visit also met with representatives of public institutions responsible for supervising the production of food. An opportunity for this was a seminar on the European meat production system, which was also attended by producers and exporters from Europe, as well as the media. 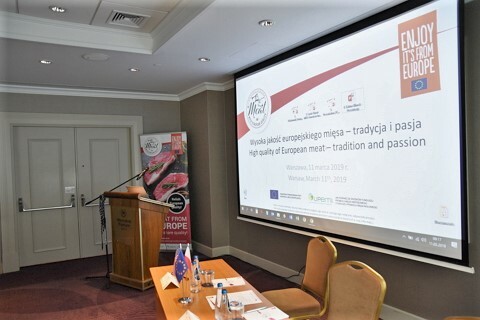 Paweł Radomski, a researcher at the National Research Institute of Animal Production, gave a presentation on the principles of the animal husbandry and meat production system in force in the European Union and their impact on the quality of the final product. Laurie Bryant, CEO of Meat Importers Council of America and one of the guests of the study visit, discussed the US meat import regulations. Bernhard Otterstein, the president of the Polish-Canadian Chamber of Commerce in Warsaw, talked about the Canadian import regulations and the recently binding CETA agreement between Canada and the European Union. Sabina Klimek, former consul of the Republic of Poland and currently chairwoman of the Polish-American Chamber of Commerce North East, presented the prospects for economic cooperation between the United States and the European Union in the context of meat trade. The seminar was broadcast online. They are available to watch on the Youtube channel of the “Meat with European quality” campaign. The visits to processing plants also entailed the subject of the European meat production system and standards. The guests from Canada and the US visited three plants specializing in different areas, which provided a complete picture of the EU meat production system: from slaughter, through cutting and processing to the packaging of finished products.